There are a lot of qualities that can factor into making a decision as to which gemstone is best suited for your engagement or wedding band. While some couples prioritize durability and resilience, others find a greater importance is aesthetic appeal – and regardless of which is number one on your list, we understand. Unfortunately, however, the number of gemstones on the market is astounding and regardless of deciding factor, narrowing the hundred – if not thousands – of stones into a comprehensive list can be exhausting! That’s where we step in. In this article, we have compiled our favorite gemstones and grouped them by color! Within each group, you will also find the durability of each gemstone as well as the metaphysical properties of its hue. If you’d like to learn more about the groups within which these stone belong, you can find that information in our complete directory of gemstone groups found here. Red is the color of love, an attribute which makes it an obvious choice when considering a stone for your engagement or wedding band, but it’s also so much more. Red is considered the warmest of all the energies and this color is associated with fire, passion, and even anger. Therefore, if you already have a short temperament, a red colored addition to your everyday life may not be a particularly wise choice. 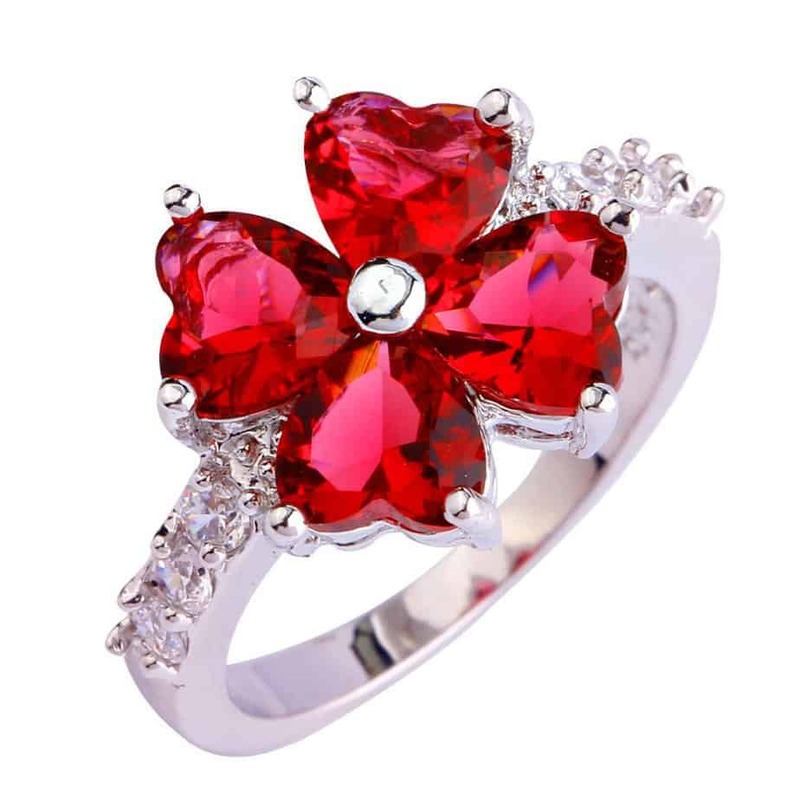 Red also represents fierceness, dominance and boldness – making it a wonderful stone for someone wanting to stand out in a crowd, but one that should be reconsidered by someone wanting to mellow down their prominence or presence. 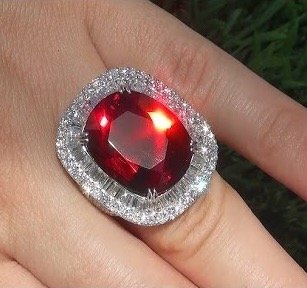 Balas is often referred to as Balas Ruby or Spinel Ruby due to the richness of its red coloring, second only to the ruby. 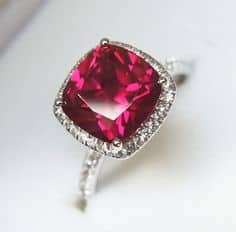 Unlike a Ruby, Spinel is typically an opaque stone, offering an option for a bride or groom not interested in the overwhelmingly desired translucent stones. Balas has more than just its shade to thank for making our list, but as a member of the Spinel family, it is also accompanied with an Mohs Hardness Rating that ranges between 7.5 and 8! Bixbite is an astonishing red gemstones native to the United States. This Utah exclusive stone is relatively rare and, in good quality, comes with an equally breathtaking price-tag. As a member of the Beryl family, Bixbite has an Mohs hardness rating of 7.5. 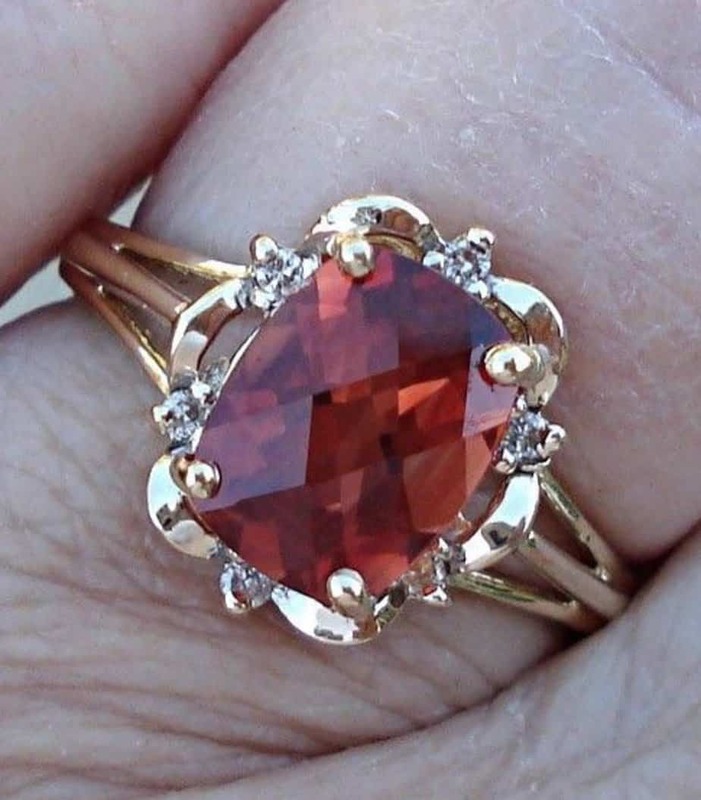 Red Garnet, if the name didn’t already give away, is a red variety of the garnet stone. In and of itself, Garnet comes in a variety of shades, a trait which has made it a popular go-to in the jewelry world. Of the large variety of colors in which this stone comes, red is the most popular and valuable hue. As a Garnet, Red Garnet falls within a 6.5 and 8.5 on the Mohs Hardness Rating Scale. Rubelite is a gemstone that can be found in pinks or reds, or somewhere in between! Rubelite is often referred to as the ‘Pink Tourmaline’ as a result of both its coloring and the group within which it is found. As a tourmaline, Rubelite has an Mohs Hardness Rating between 7.0-7.5. It is important to note that though Rubelite is often found in shades or red – red Rubelite is not nearly as valuable as deep pink Rubelite is. 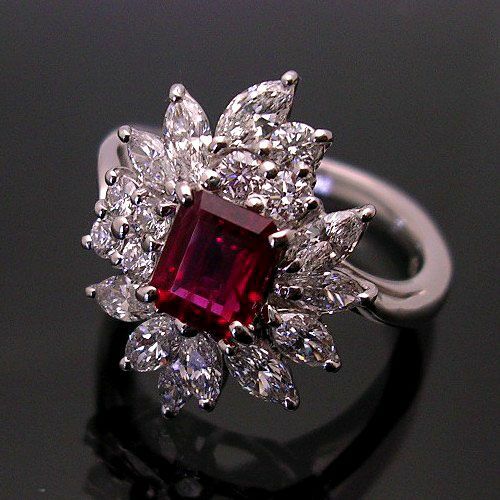 Ruby is a deep red gemstones and is considered one of the world’s most precious gemstones. Ruby’s impressive luster and deep coloring make it a popular and highly sought after gemstone for wedding and engagement rings. Ruby is a member of the Corrundum group and has an Mohs Hardness Rating that ranges from 6.5-7. Aquamarine is a stunning shade of light blue. Aquamarine’s delicate tints of baby-blue make it a highly desirable stone in both wedding and engagement rings, particularly due to the fact that it matches with virtually every imaginable metal. As a Beryl, Aquamarine holds an Mohs Hardness Rating that ranges between a 7.5 and an 8. 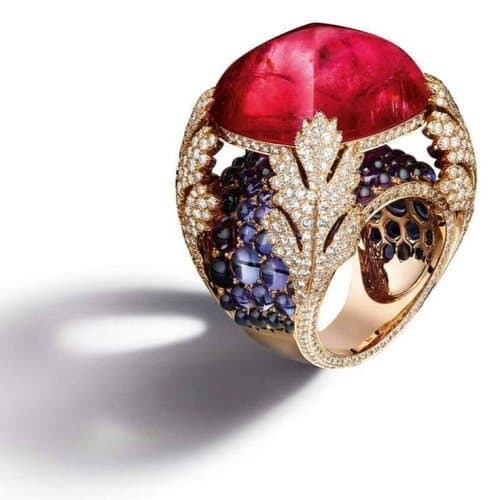 Blue Garnet is a member of the well-known and highly versatile garnet family. 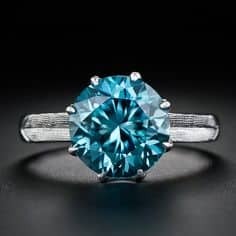 Blue Garnet is extremely rare – a GIA certified 10 carat cut can be purchased for a little under $100,000 – a high price to pay compared to some of the other blue stones on this list. The deep oceanic shade of this stone, however, makes that price understandable and justifiable. 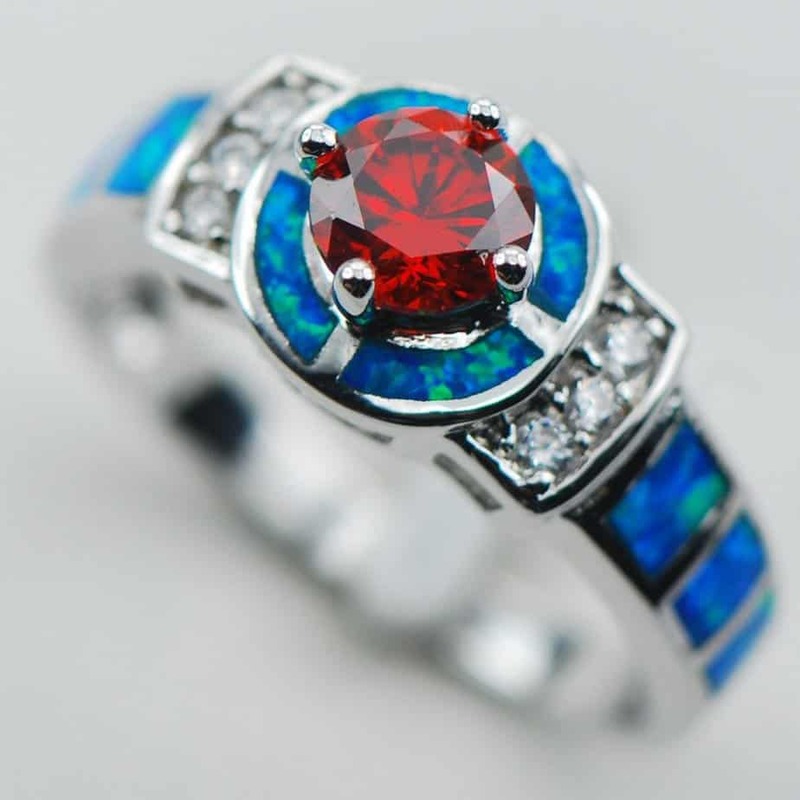 The Mohs Hardness Rating of Blue Garnet is in the range of 6.5 and 8.5. Blue Quartz gets its coloring from the inclusion of blue tinted minerals within the face of the stone, though even then, it is rare to find naturally. Most forms of Blue Quartz are heat treated to reach their desirable hues, a practice that can have a negative impact on the stones hardness and durability. As a Quartz, an unenhanced Blue Quartz has an average Mohs Hardness Rating of 6.75. 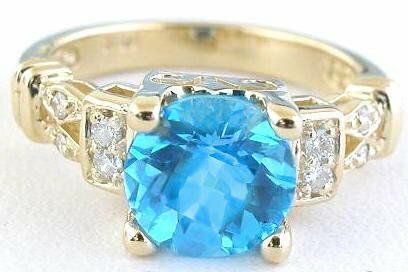 Blue Topaz is the second most popular blue gemstones, and we understand why. This stunning stone is a mesmerizing shade of blue that is more intense than aquamarine but not as deep as Sapphire, while rating at an impressive 8 on the Mohs Hardness Rating Scale! 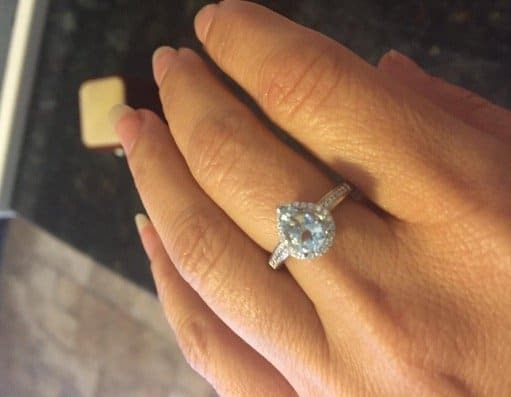 Blue Topaz, however, commonly obtains its color through irradiation – the irradiation has very little effect on the stone but has faced some debate in recent years that may be worth looking into prior to making the decision to add this stone to your wedding or engagement band. 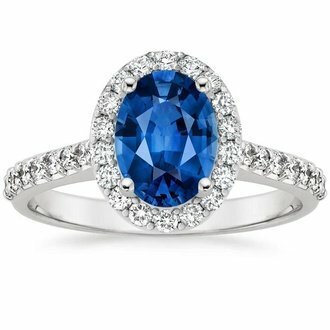 Blue Zircon is an extremely underrated gemstone in our opinion. This blue gemstone has the intense coloring of a Blue Topaz while simultaneously displaying notable luster and fire and best of all, it is an astonishingly affordable stone. As a member of the Zircon group of stones, Blue Zircon has an Mohs Hardness Rating that ranges between 6.5 and 7.5. Indicolite is a gemstone that teeter-totters on the bluish green line. 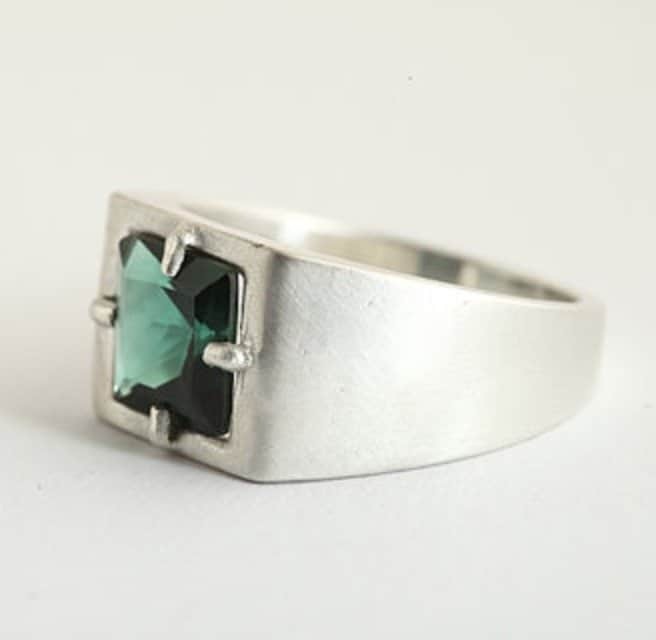 Indicolite is a very sophisticated shade of blue and is often found in antique style jewelry as a result of its hue. This tourmaline has an average Mohs Hardness Rating of 7.5. 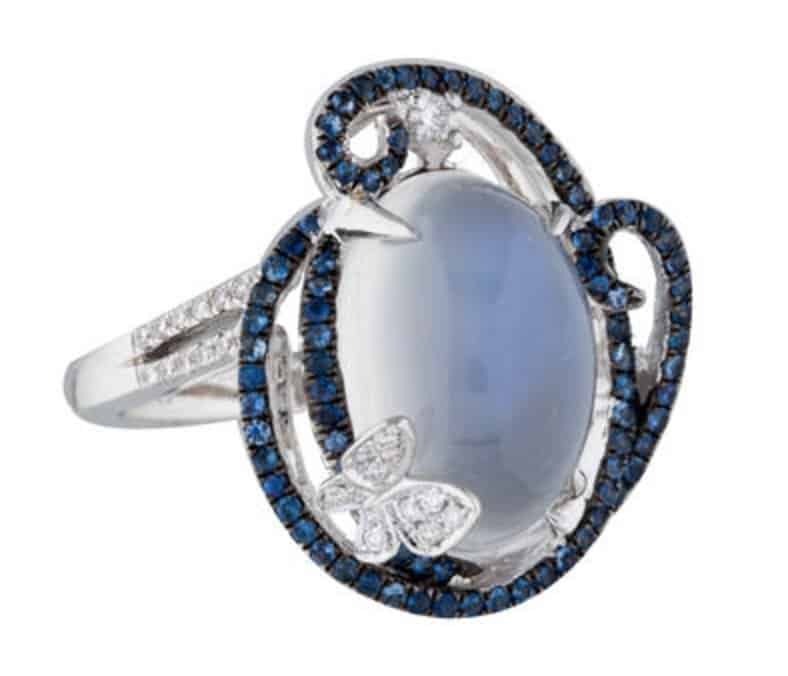 Moonstone shouldn’t be considered a blue gemstone, but for the purpose of this article, it is. Although, in and of itself, gemstone is a white, and sometimes colorless, stone that carries an incomparable adularescent effect, the finest and rarest varieties of this stone also contain a particularly breath-taking and other-worldly blue shimmer. Despite its beauty, Moonstone has a relatively low Mohs Hardness Rating od 6.5. Paraiba is a transparent aqua hued gemstone that has an internal glow that is unlike any other on this list. 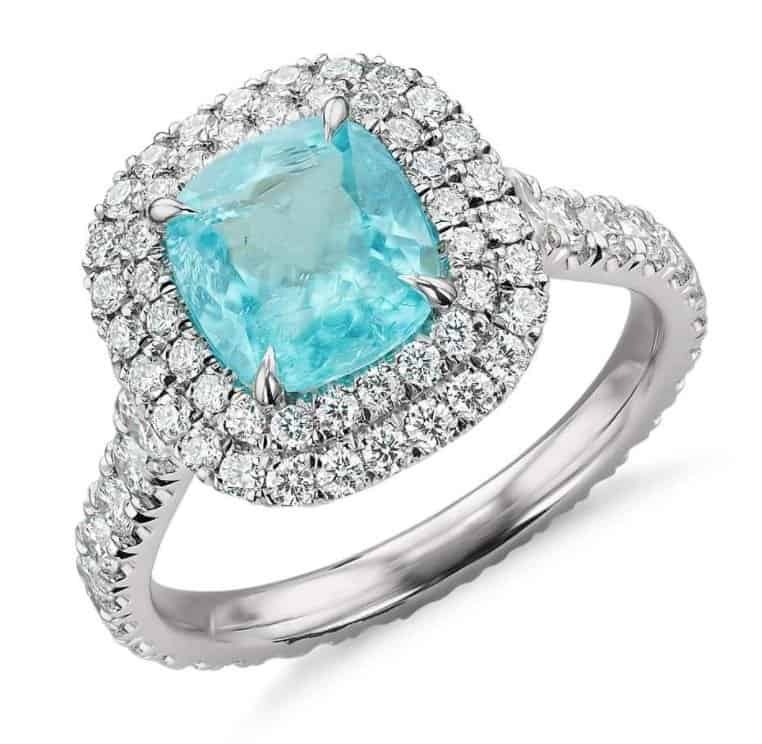 While beautiful, Paraiba is an extremely rare gemstone making authentic Paraiba rare and extremely expensive. 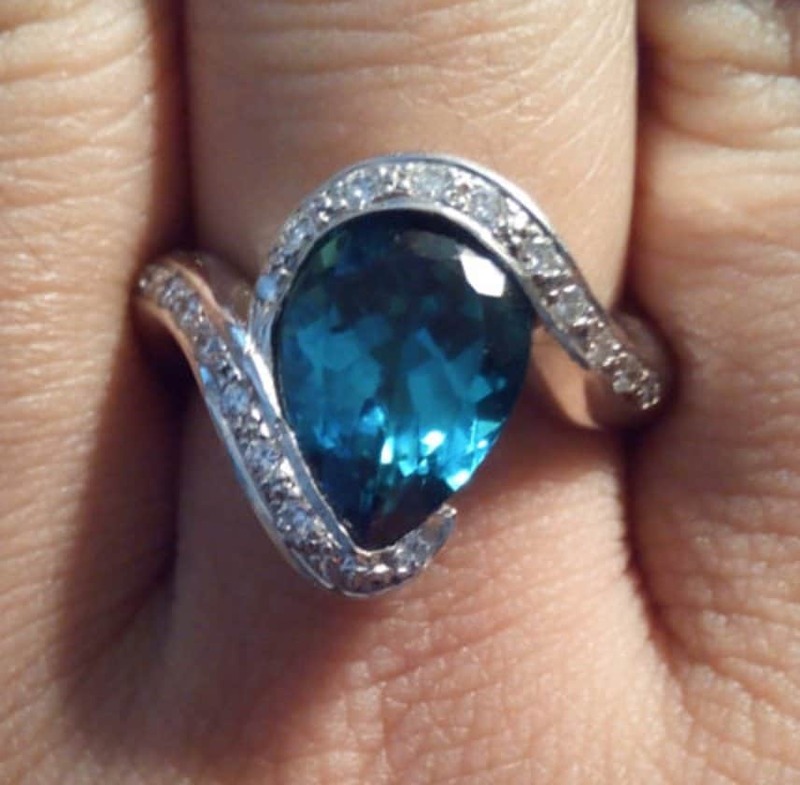 Paraiba is a member of the Tourmaline family and has an Mohs Hardness Rating of 7.5. Sapphire is the king (or queen) of all blue gemstones! 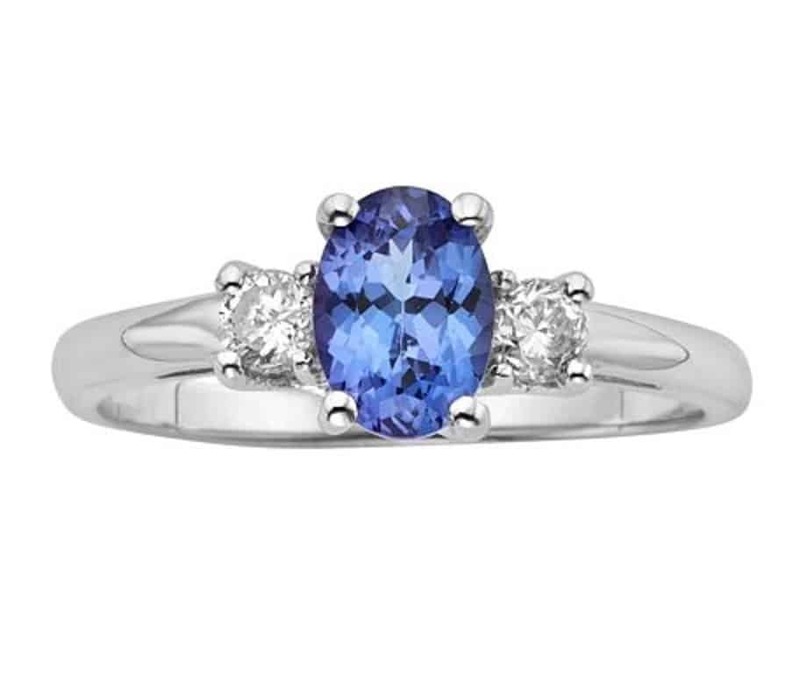 This dark blue gemstone complimented, and continues to compliment, the wedding and engagement rings of the Royal Family reaffirming the colors correlation with loyalty and royalty. This highly saturated magnificently colored stone is a member of the Corrundum family and has a Mohs hardness rating of 9, which is remarkably high on the scale that is capped at 10. 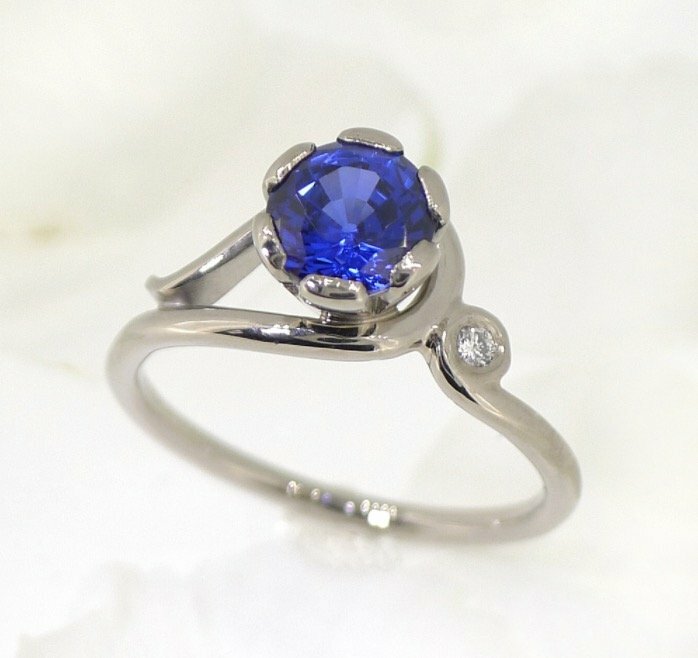 Tanzanite is a stunning stone that varies in color depending on the angle from which it is perceived, though as a whole. It possesses a hue that is reminiscent of both blue and violet. Though this stone is a pretty recent discovery and an affordable gemstone, its availability is about to decrease as a result of no longer being readily available for mining – a result of which will indefinitely be a spike in demand and value. Tanzanite is a type of Zoisite and has an Mohs Hardness rating of 7. 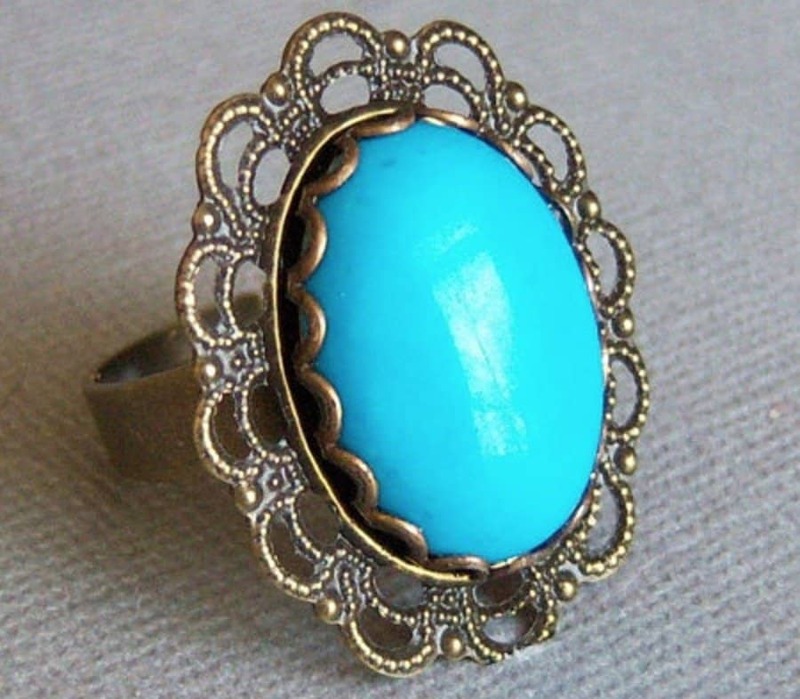 Turquoise is another of the opaque blue stones that made this list! This beautiful stone has a unique shade that is reminiscent of clear Amazonian waters and may very well be the oldest documented stone in the history of mankind – beauty and a rich history, what more can you ask of the addition to your future wedding or engagement band? 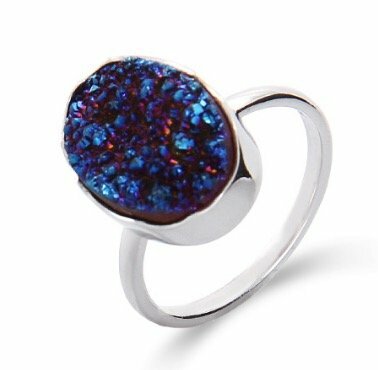 Unfortunately, Turquoise has an Mohs Hardness Rating of 5-6, meaning that a ring with this stone will demand a little extra TLC. Green is the color of nature – it is reminiscent of the environment, the wilderness, and all the organic wonders of the world. 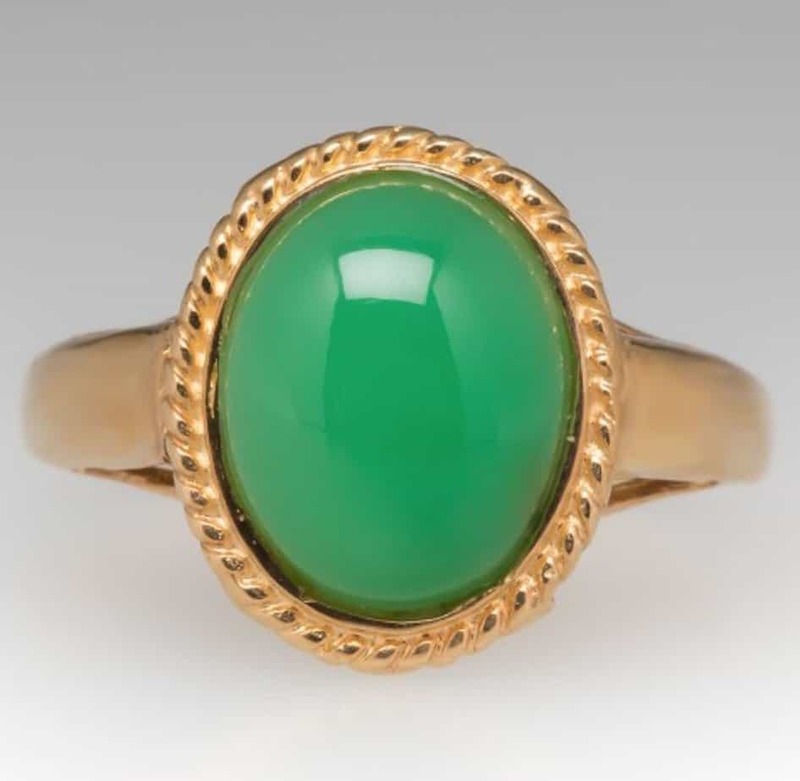 Green is also the color of spring and is associated with new life – so it is no surprise that this ring is often used in an attempt to induce fertility. Aventurine is a semi-opaque grass shaded green stone, though sometimes its coloring is darkened to a forest-green like hue. This beautiful gem has a natural shimmer that is appealing to many collectors, brides and grooms alike. 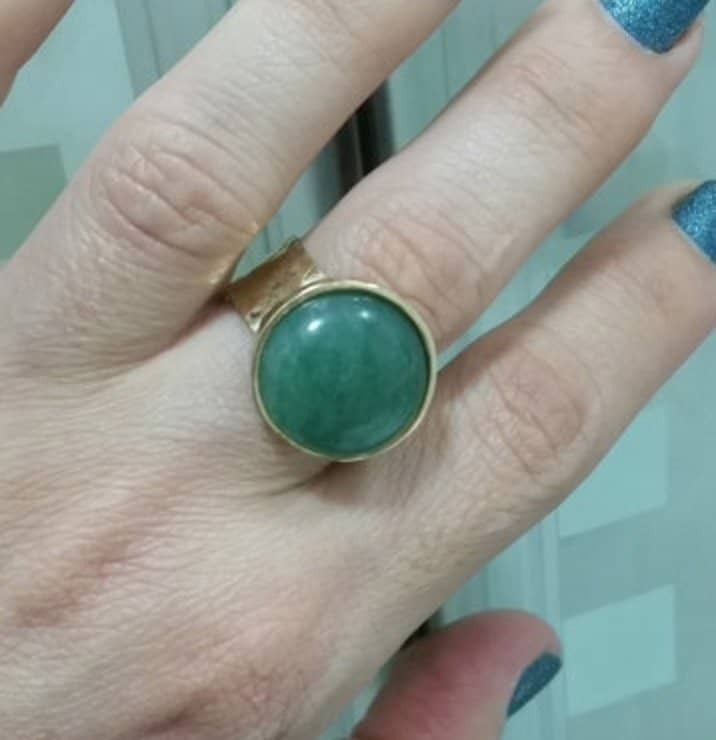 Aventurine also has a decent Mohs Hardness Rating of 7 and is easily shaped, making it a respected stone amongst jewelry designers. Chrome Tourmaline is a rare gemstone that is native only to Africa. This beautiful stone has an intense saturation, making smaller variations of the stone unpopular as they border black more than they do green. This amazing gemstone is a member of the Tourmaline family and has an Mohs Hardness Rating of 7-7.5. Chrystoprase is an opaque gemstone that possesses a radiation, almost glowing, green coloring. Though alluring, this color often fades with prolonged exposure to heat and sunlight – a factor which some say is irreversible. Chrystophrase is often used in statement pieces but would make a great addition to an engagement or wedding ring for a couple that wants something ‘out of the box’. This chalcedony Quartz has an Mohs Hardness Rating that ranged between 6.5 and 7. Demantoid is a light, almost pastel, shade of green making it less intensely colored that the previously discussed green gemstones. Demantoid is a transparent gemstone and gains its popularity from its delicate and feminine appearance. Demantoid, as a member of the garnet family, isn’t particularly rare, though this rarity increases with the stones carat size. Demantoid’s Moh’s Hardness Rating ranges between 6.5 and 7. 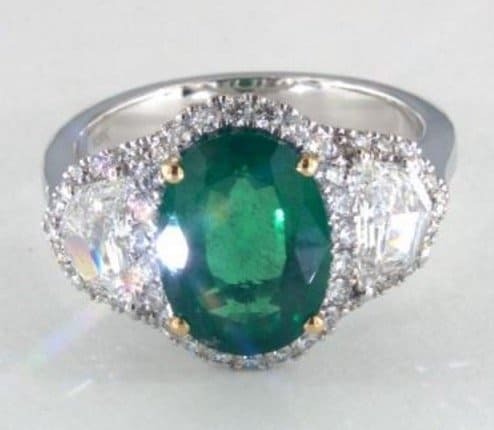 Emerald is the top dog of green gemstones! 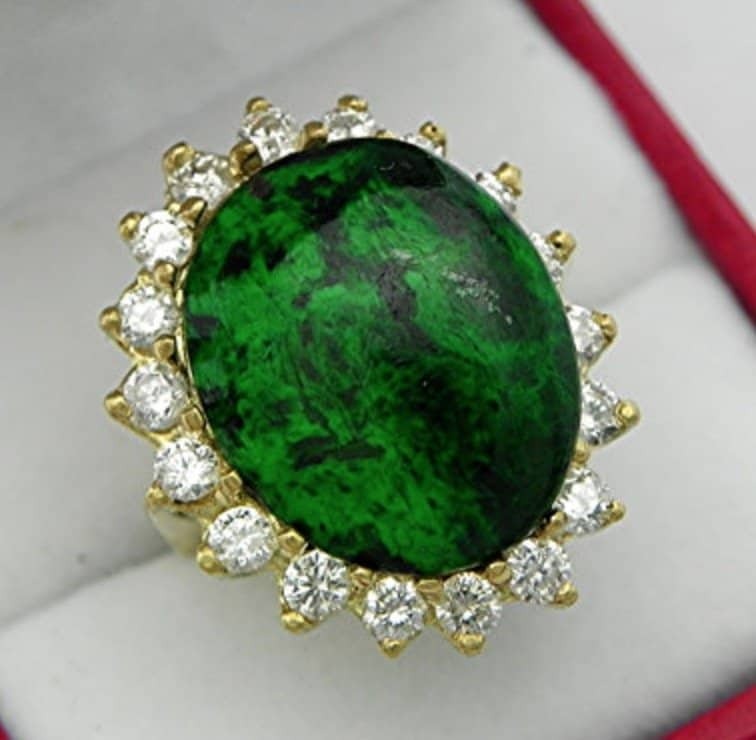 This stunning deep green gemstone has a history that spans billions of years and has gained popularity amongst royalty along the way – the most interesting of which being Cleopatra. As a result of its unique natural shape, designers created a broad but shallow cut to highlight the beauty of this stone – now known to us as the emerald cut! 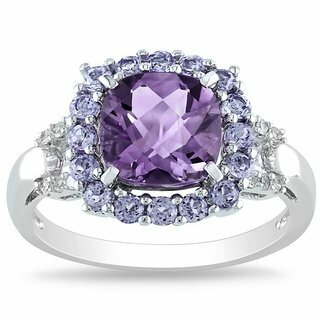 This beautiful beryl has an Mohs hardness rating of 7. Green Beryl, like Emerald, is a green colored stone that falls within the Beryl family and has an Mohs hardness rating of about 7. 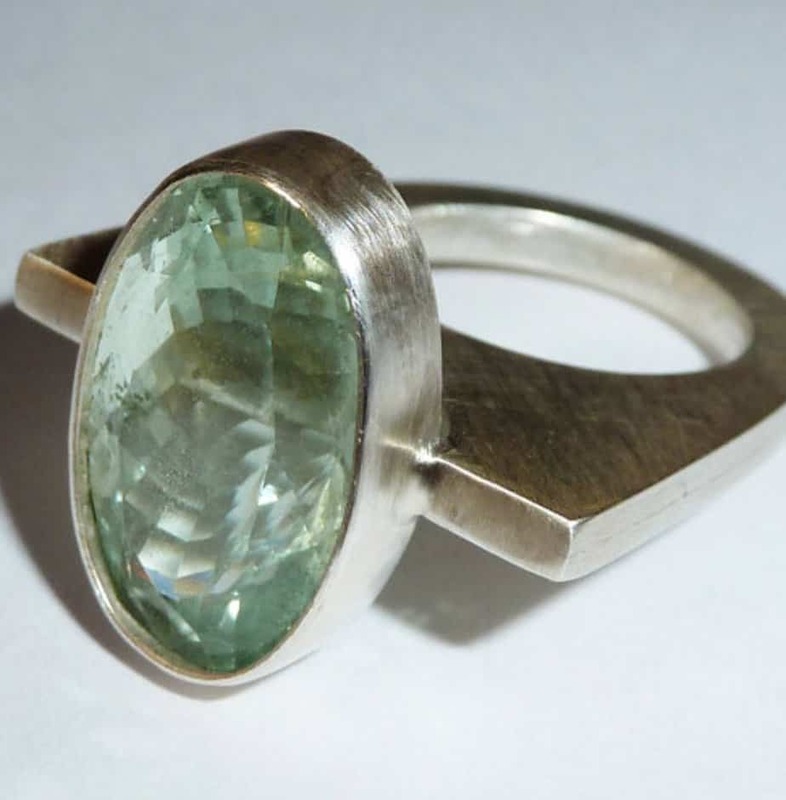 The typical distinction between the two, Emerland and Green Beryl, is the intensity of its color. 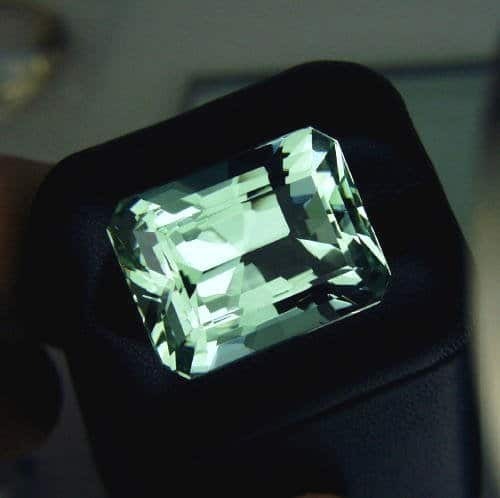 Green Beryl is the common name for Beryl’s that are too light or too unsaturated to gain the title of ‘Emerald’. So, where does one draw the line on the difference between the two? The answer: the difference between the two is vague and still being debated amongst gemologists. Green Zircon is a member of the class that holds the title of being the oldest mineral on the earth – 4.5 billion years old, to be clear. This olive green stone is transparent and has impressive luster and refractivity. 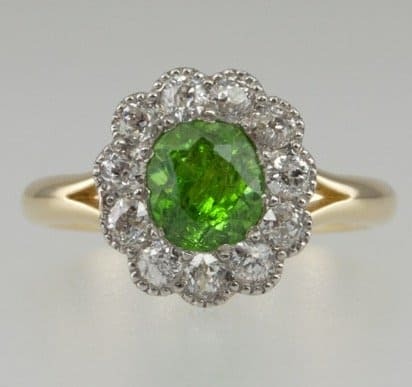 Green Zircon stones are rare and highly desired by collectors as the color is attributed to a damaged internal structure which created higher fire than other varieties of stones within this group. 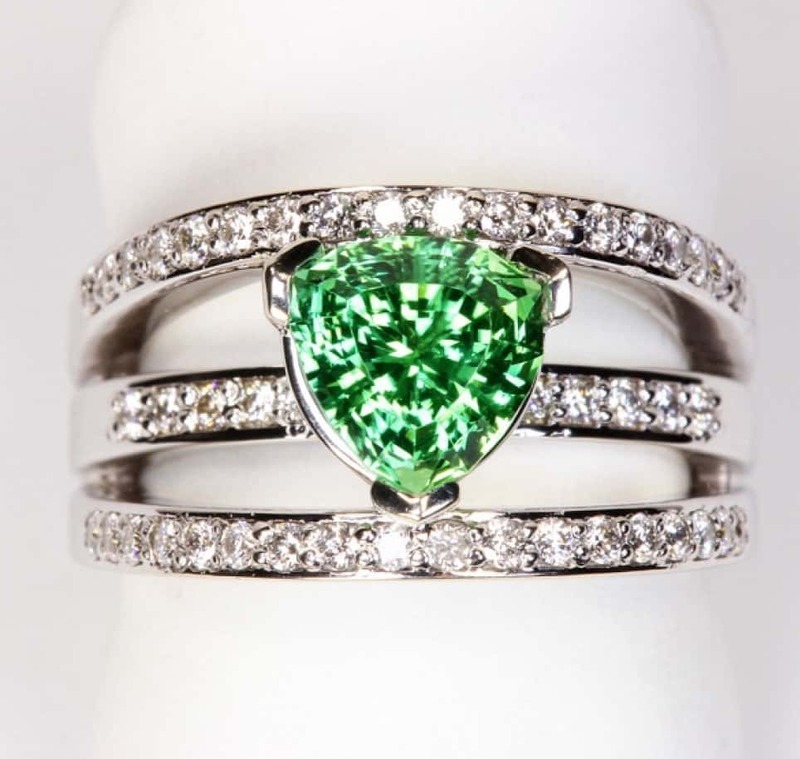 Green Zircon has an Mohs Hardness Rating of 6-7.5. Hiddenite is a gemstone that varies greatly in its coloring – ranging from yellow tinted hints of green to blue-green. The interesting thing with the variety of color in hiddenite is that, in some circumstances, the color variety can be found in a single cut! Hiddenite isn’t typically used as a gemstone for wedding or engagement bands, but when it is, its varying degrees of coloration are remarkable! This green variety of Spodumene has an Mohs Hardness Rating that ranges from 6.5-7.